Ad un anno dalla morte di Rindt, la F1 torna a Monza ma senza le Lotus ufficiali. Le prove vedono i motori a 12 cilindri farla da padrone, con Chris Amon (Matra) in pole, davanti a Ickx (Ferrari), Siffert e Ganley con le BRM, Cevert (Tyrrell) e Peterson (March). Al via grande partenza di Regazzoni (Ferrari) dall' ottava piazza che va in testa, e inizia subito la lotta con Peterson, Stewart (Tyrrell), Cevert, Ickx e Gethin (BRM). Tra il 16° e il 18° giro si ritirano Stewart, Ickx e Regazzoni, mentre gli altri si alternano al comando in una lotta serratissima. 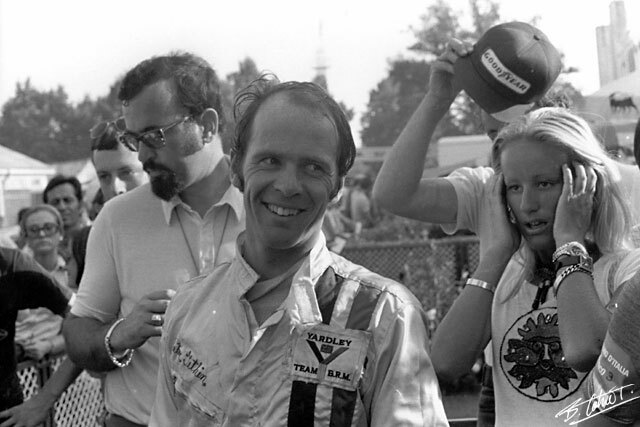 L' ultimo a staccarsi dal gruppo di testa è Amon per problemi alla visiera, e lascia così Ganley, Hailwood (Surtees), Peterson, Cevert e Gethin a giocarsi la vittoria. 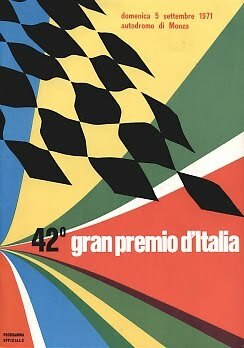 E' un finale a 5 incredibile, con un arrivo in volata e distacchi di centesimi: primo è Gethin, davanti a Peterson a 0,01, quindi Cevert a 0,09, Hailwood a 0,18 e Ganley a 0,61 !!! Fantastico. 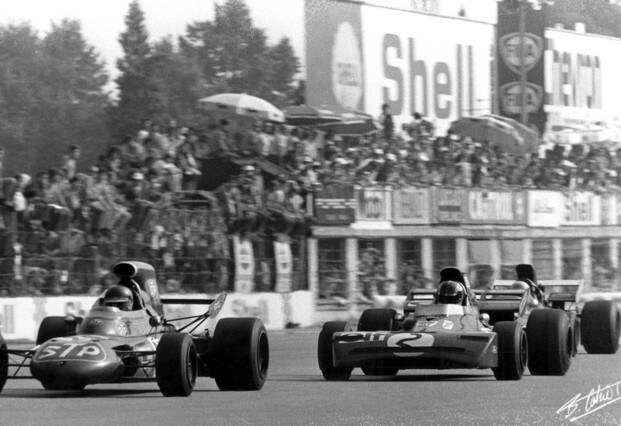 A year after the death of Rindt, F1 is back in Monza but without the official Lotus. 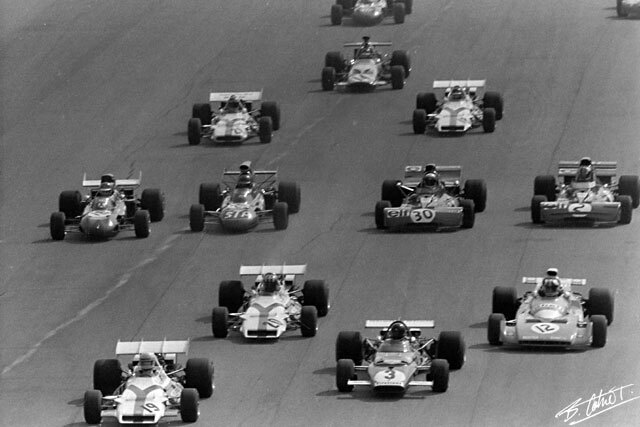 The evidence they see the 12-cylinder engines lead the way, with Chris Amon (Matra) on pole, ahead of Ickx (Ferrari), Siffert and Ganley with BRM, Cevert (Tyrrell) and Peterson (March). Starts great start Regazzoni (Ferrari) by 'eighth place that goes in the head, and start the fight with Peterson, Stewart (Tyrrell), Cevert, Ickx and Gethin (BRM). Between 16 ° and 18 ° around withdraw Stewart, Ickx and Regazzoni, while the others take turns in the lead in a tight fight. L 'last to break away from the leading group is Amon for problems with the visor, and so leaves Ganley, Hailwood (Surtees), Peterson, Cevert and Gethin to fight for the victory. It 'a final 5 amazing, with a final rush and detachments cents: first is Gethin, in front of Peterson at 0.01, then to 0.09 Cevert, Hailwood 0.18 and 0.61 Ganley !! ! Fantastic. Через год после смерти Риндт, F1 возвращается в Монце, но без официального Lotus. Доказательства они видят, 12-цилиндровые двигатели проложить путь, Крис Амон (Matra) на полюсе, впереди Ickx (Ferrari), Зифферт и Ganley с BRM, Cevert (Tyrrell) и Петерсон (март). Начинает отличный старт Regazzoni (Ferrari) на «восьмое место, которая идет в голову, и начать борьбу с Петерсоном, Стюарт (Tyrrell), Cevert, и Джетин Икс (BRM). Между 16 ° и 18 ° вокруг уйти Стюарт, Ickx и Regazzoni, а остальные по очереди занимали ведущие позиции в жесткой борьбе. L 'последняя отрываться от ведущего группы Amon проблем с козырьком, и поэтому листья Ganley, Hailwood (Surtees), Петерсон, Cevert и Джетин, чтобы бороться за победу. Это окончательный 5 удивительно, с окончательным порыва и отрядами центов: первый является Gethin, перед Петерсона на 0,01, а затем 0,09 Cevert, Hailwood 0,18 и 0,61 Ganley !! ! Фантастический.